One of the few wildflowers worth looking forward to once the spring 'fireworks display' is over, Common Toadflax is an uncommonly beautiful perennial. Looking very much like a snapdragon, this upright plant grows to between 15 and 90cm in height and spreads to a similar width. Its narrow strap-like leaves are bluish green and hairless, while the yellow flowers, 25 to 33mm long, have orange lower lips that become deeper orange as they age. Toadflaxes are sometimes misidentified as wild snapdragons, but the spur behind the flower of a toadflax is a helpful distinguishing feature. 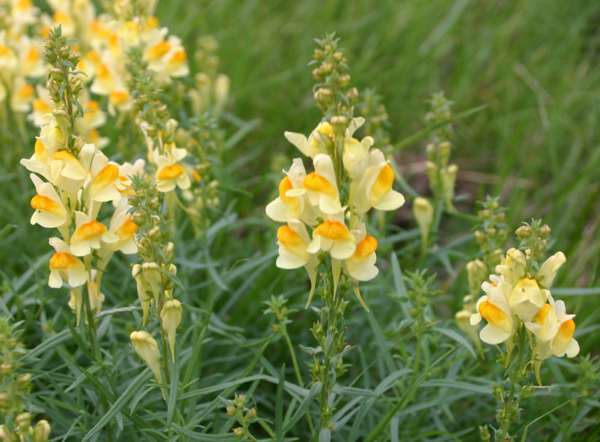 Common Toadflax is found throughout the UK and Ireland and in most European countries including France, Italy and Slovenia as well as much of western and central Asia. In North America, Common Toadflax is an introduced alien species and it has now become common and fairly widespread in its distribution. A summer plant that copes better than most with dry spells and blooms from mid June until late October or even into November - much the same time as its close relative Pale Toadflax Linaria repens, Common Toadflax loves disturbed wasteland and the edges of paths through dry grassland; it is also seen in hedgerows and on well drained grassy banks. 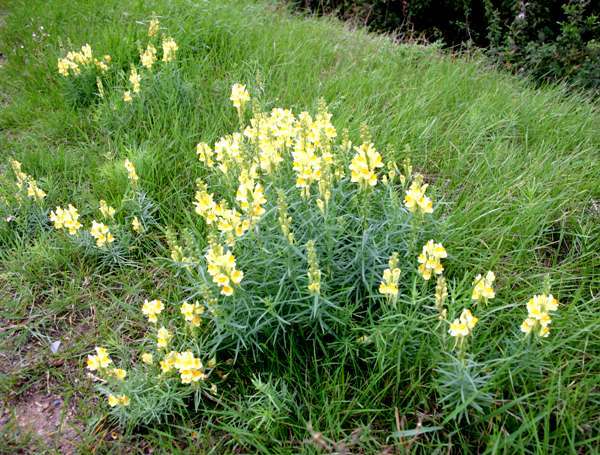 Linaria vulgaris has a long history of use in herbal remedies for a wide variety of ailments including jaundice, dropsy and enteritis. A laxative tea used to be made from the leaves of Common Toadflax, which was also the basis of ointments for various skin diseases and for treating piles. 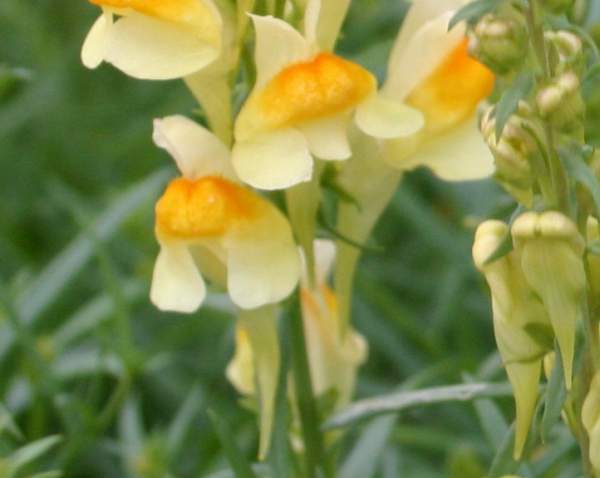 Other recorded uses include the production of insecticides, which may seem rather odd because bees and other nectar-hunting insects seem to love the flowers of Common Toadflax. Linaria, the genus name, comes from the Latin noun Linus, meaning flax or linen. The specific epithet vulgaris means common, and in this instance it seems quite appropriate when applied to Common Toadflax; however, the same epithet is used in many genera, and in some of them the most common species has not necessarily been given the name vulgaris.